BATTLE CREEK, Mich. — This January, Kellogg’s Rice Krispies will be rolling out its first new flavor in more than 10 years with Kellogg’s Strawberry Krispies. Strawberry Krispies are said to deliver on one of fans’ top flavor preferences by pairing the simplicity Rice Krispies are known and loved for with a delicious new natural strawberry flavor. “Additionally, fans will be excited to know that the process of making the new Strawberry Krispies cereal is as straight-forward as the flavor itself. It all starts with a single grain of rice, which is cooked, dried, flattened and puffed to perfection. 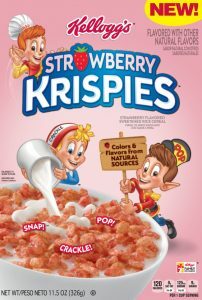 The puffed rice cereal is then coated with flavor, ensuring that each bite of new Strawberry Krispies delivers a delightful burst of simple, strawberry flavor,” Stolsky explained. “From the moment its delightful aroma meets your nose, down to the last sip of strawberry-flavored pink milk in your bowl, new Strawberry Krispies is a delicious experience the entire family can enjoy. Plus, with its new pink color, Strawberry Krispies also offers even more treat-making possibilities, just in time for Valentine’s Day,” he concluded.